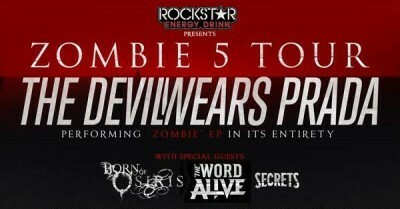 Baltimore Soundstage was filled with anxious fans ready to see the “Zombie 5 Tour”, a celebration of The Devil Wears Prada’s Zombie EP which was released five years ago. Although most were there to see TDWP, plenty were just as excited for the openers: SECRETS, Born of Osiris, and The Word Alive. SECRETS did a great job opening and were able to get the crowd energized for what would be a memorable night. Frontman Aaron Melzer took command of the stage as he crushed heavier tunes like ‘The Oath’ and ‘Artist Vs. Who?’. Clean vocalist/ guitarist Richard Rogers’ vocals intertwined beautifully with Melzer’s screams and he even stepped away from his guitar for ‘Dance of the Dead’ which brought the focus to his vocal abilities. SECRETS closed the night with ‘Live Together, Die Alone’ which really brought the crowd into high gear, and put a massive smile onto Melzer’s face. Next up was, Born of Osiris, hailing from Chicago, IL. The quintet started the night with “Divergency” and two mosh pits began to open as the song progressed. There were obviously a decent amount of fans in attendance as the crowd began to get rowdy. Guitarist, Lee Mckinney, captivated the audience with his incredible guitar solos throughout their set. I have never seen Born of Osiris play before, but the group left me very impressed with their performance, finishing off their night with “Machine”. By the time The Word Alive stormed onto the stage, the crowd had probably doubled in size. Frontman, Telle Smith’s presence was infectious and the crowd went crazy as soon as he stepped on stage. Smith would change from high shrieks to burly growls in an instant, showing off the control he has over his voice. Guitarists Zack Hanson & Tony Pizutti were musically in sync throughout the night along with drummer, Luke Holland, who is always a pleasure to see perform. ‘2012’ was the most intense song of their set that night, the crowd started a massive circle pit which later turned into multiple mosh pits. TWA finished their set with crowd favorite ‘Life Cycles’, which had Telle jumping into the crowd, leaving fans with a night to remember. The lights dimmed and the signature logo lit up, The Devil Wears Prada made their way on to stage, ready to play for a very eager crowd. They started off with a bang, heading straight into ‘Assistant To The Regional Manager’. TDWP played for a little over an hour straight without even stopping to take a break. That time was filled with an abundance of crowd surfers, crowd sing-a-longs, and massive pits. Prada played a variety of older songs like ‘Reptar: King of The Ozone’ and ‘Hey John, What’s Your Name Again?’ which left the die hard fans very pleased. Of course the night also included ‘Zombie EP’ being played front to back for the first time ever. Fans were also delighted to hear a brand new track that is yet to be released. Prada left the stage, but quickly came back out to perform an encore that consisted of “ Born to Lose” and “Danger: Wildman”. TDWP gave their all into their performance and the crowd gave them the same energy back.